Usmania Restaurant serves Pakistani food. Usmania Restaurant is located on GT Road, Kharian. It serves Pakistani food. 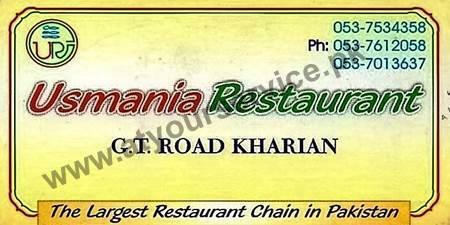 Usmania Restaurant in Kharian is part of the chain of the restaurants in Pakistan serving under the same name. i need job in your hotel.. because its hotel my near.. if you any information about me please send message in my Email.